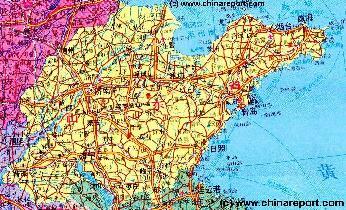 The Shanxi Province Maps Index gives acces to all Maps relevant to Shanxi Province and Area's of Specific Interest within that Province, as used and/or produced by ChinaReport.com. Please use these Maps to find your way easily around the Province, Cities, Area's and many Monuments & Landmarks. An overview Map of Asia Entire clearly demarkating the Territories, Nations and Tribal Area's of the Continent in the year 565 AD. Japan is split between the Yamato Kingdom and Emishi. In Korea three Kingdoms Rule among which the largest Goguryeo. 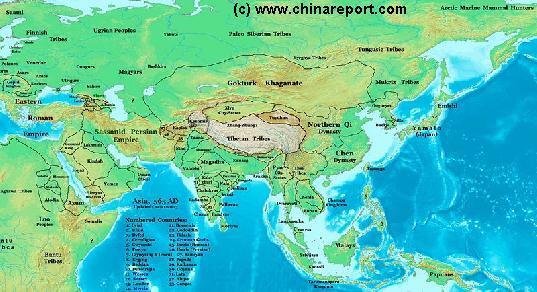 China is split in a Northern Dynasty of the Qi, and a Southern Dynasty of the Chen. Mongol Tribes in the Gokturk Khanate and the appearance of the smal XiYe City State in the Tarim River Basin. A Schematic Map of the Mongol Empire of Genghis Khan (TeMuJin) and descendants through its several stages of conquest in its short but Impressive Existance in History. Timeline depicts the Mongol Conquest starting in the Year 1206 AD, when Genghis Khan first united the Mongol-Turkic Tribes of Mongolia and Lake BayKal becoming Great Khan. The Timeline continous through the year 1219 AD, the year 1223 AD taking Transoxiania, 1227 AD, 1237 AD when the Northern Jin Dynasty of China was annihilated, 1259 AD conquering ancient China above the Jiangste River and 1279 AD when all of China was taken and the Yuan Dynasty established under the Kublai Khan. Last is the Year 1294 AD when the Mongol Empire reached its largest geographical size and Zenith, 22% of world land area, but through lack of central leadership and over-expansion fragmented into 4 large parts, then imploded upon itself. 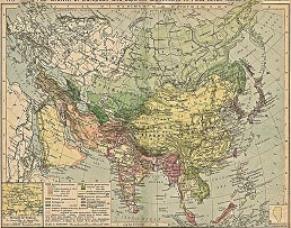 An obviously non-Chinese but western-made Map of the Ching Dynasty Chinese Empire in the year 1910 AD, a year in which China's sovereignty has been under threat and siege for over 70 years. 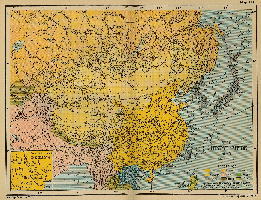 In this Map of 1910 AD, made one year before the abdication of Last Ching Emperor Xuan Tung (a.k.a.Aisin-Gioro Pu Yi) and the final end of China's Feudal History, China is depicted as in its smallest boundaries and definition. 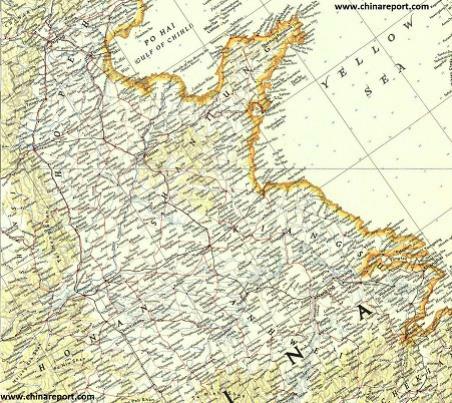 Most notably the North-East (Manchuria), and Inner Mongolia, both territories nominally under Chinese Control and under Chinese Sovereignty are depicted as separate area's. Other interesting features of the Map and geography of the Time : after the Sino-Japanese war of 1899 AD, both Korea and the Island of Formosa (now Taiwan / ROC) have been annexed by the Japanese Empire and Port Arthur (Dalian) is now a Treaty Port and a leased Base for the Russian Pacific Fleet. B) A very good overview Image Map of Beijing-TangShan-TianJin-ShiJiaZhuang Quadrangle in North China. Depiction of all major population centres, villages, highways, rivers, etc. in this General Area, around, East and South-East of Beijing. A) A very good overview Image Map of Datong-Beijing-TaiYuan-ShiJiaZhuang Quadrangle in North-China with Beijing City Province. 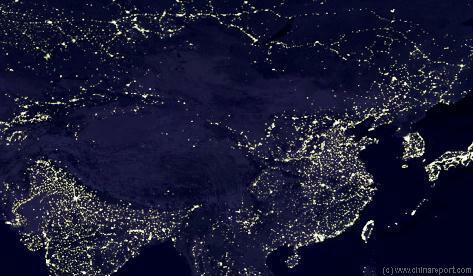 Depiction all major population centres, villages, highways, rivers, monuments, mountains in this General Area West and South-West of Beijing. 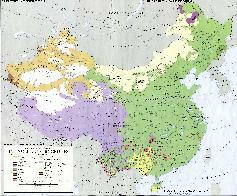 For All Maps of Hebei Province - Click Here ! Hebei Province Map Index Page. All overview Maps of Hebei Province, Cities in Hebei Province and their surrounding Area's, major landmarks and Monuments of Hebei Province and More. Full and complete Map of China (PRC) identifying all Language Areas big and small in all Provinces and Autonomous Regions of China. This Satellite Image provides an overview of all cities and provinces within the Peoples Republic of China & wider Regions. Locations visible lie roughly between Kabul-Afghanistan in the West, Osaka-Japan in the East, Krasnoyarsk in the North and Sanya on Hainan Island in the South. Find the large coastal cities and main Chinese Civilization Centres on the Chinese Plains between Beijing i/t North o/t Plains and Hong Kong and Guanzhou (Canton) in the Extreme South. 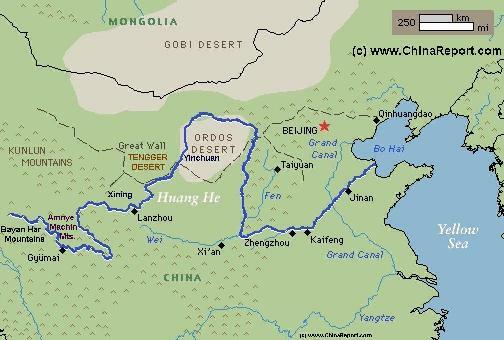 Follow the Flow of the Yellow River and cities and towns strewn along it from Xining-Qinghai Province, through Lanzhou-Gansu and Yinchuan-Ningxia to flow along the Western Shanxi Province Border and find the black holes created by the Gobi and Taklamakan Deserts as wel as Tibet-Qinghai Plateaux. A Geographic overview Map of Shanxi Province entire delineating provincial borders and parts of neighboring Hebei Province in the West, Jiangsu Province to the South and Henan Province in the South-West. Includes Cities and Towns (shown by size), Main Monuments & landmarks of Shandong Province, the flow of the yellow river Shandong Province, Main Mountains (with Height), major highways, provincial railroads and main railroad-stations and main waterways & rivers. This Map further provides links to on site photos and information on the Cities and Area of Jinan, Qingdao and Dufu - Home of Confucius. 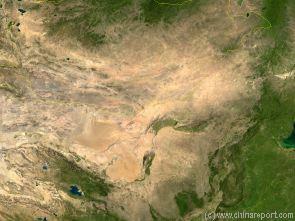 A Full Google Earth Supported Map of Shandong Province by Google.com. The China Report introduced on Levels of its Online Publishing's in April of 2009, including Shandong Province. Adjacent Map gives direct access to Map Of Shandong Province by Google. A Geographic Map of parts of Shandong Province, Jiangsu Province , Anhui Province and parts of Henan Province of China in the year 1953 AD. 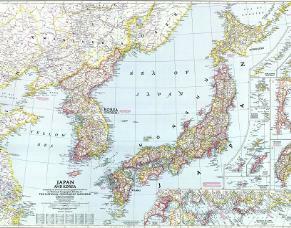 An accurate Geographic Map of the East Asian Coastal Regions of China (Republic), the Korean Peninsula, the Japanese Islands and associated Regions in the Year 1945 AD. At that Time large parts of Manchuria and Inner Mongolia remained under Japanese Occupation as part of the created State of Manchukou, while Korea was actually annexed and to be fully included as a Province of Japan. Included in this Map are the main cities across the Chinese Coastal Regions, the Korean Peninsula and Islands with their names of 1945 and present day. Marked in Colors for clarity are the various colonial and imperialist Nations. Included in the Map are Main Cities, Towns and Villages, sections of the Great Wall of China as well as main road connections, railroads, current day sites of tourist interest as well as some of the North Korean ethnic minority villages on the Sino-Korean Border.